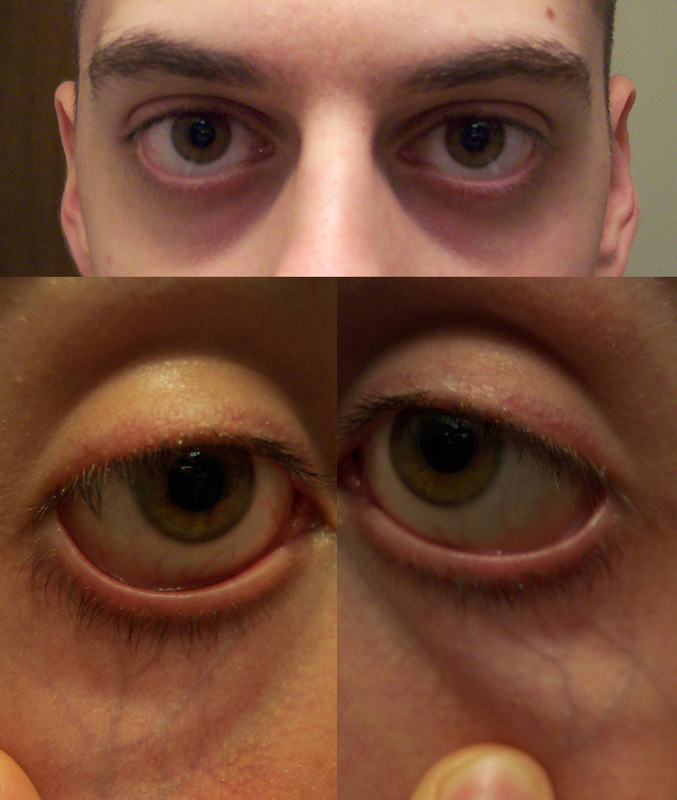 HomeDark Circles Under EyesWhat Causes Dark Circles Under Eyes? You woke up one morning and they were just there! You didn’t go on a bender. You don’t have any sort of illness that you’re aware of. You ask your daughter, but she swears she didn’t paint your face with her makeup while you slept . . . again. So what are those dark circles under eyes? What Causes Dark Circles around Eyes? For the possible answer to that question, read on. Some of the thinnest skin we have on our bodies is located in the Periorbital region of our face. Periorbital, loosely translated, means “around the eyes.” It is mostly the region just below the eyes that we will be talking about. The area that often appears dark or puffy after little sleep of extended sickness. 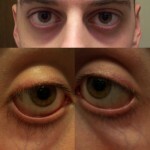 The next 2 sections on internal and external causes of dark circle eyes may be somewhat interchangeable. For some it’s the “chicken or the egg”. Allergies – Millions of people suffer from allergies, and this can be a major contributor to the puffiness and dark circles under eyes. Sinus Infection and Cold – Once the area behind your eyes gets filled with mucus and infection it is highly likely that you will experience Periorbital symptoms. Aging – Everyone experiences dark circles under eyes to some extent as they grow older. Good skin care earlier in life can help fend off and lessen the severity of these types of conditions later. Excessive Pigmentation – The thin skin under the eyes allows the microscopic layer of blood vessels known as capillaries to actually show through the skin. This makes for darker patches of skin. If you pull the Periorbital skin to the side and blotches appear, it is a pretty good indication you have Excessive Pigmentation. Genetics – If your parents of grandparents had dark circles under eyes, it’s quite possible you also will have the condition. There’s not much you can do in the way of prevention, but treatment is the same. Medical Problems – There are illnesses that can cause the situation. Both the Thyroid and Kidney can malfunction, and one of the symptoms is dark circles under eyes. Anemia – Although this can be fixed with diet, I list anemia as one of the internal illnesses, as it is caused by a lack of Iron in the blood. Crying – Excessive crying usually comes with things like rubbing and wiping of the eyes, as well as snotty noses. Both in combination can lead to dark patches in the Periorbital skin. Itching – Allergies lead to itching, and itching leads to scratching or rubbing, and all those lead to dark circles. Makeup – Sometimes makeup can lead to Periorbital Darkness. 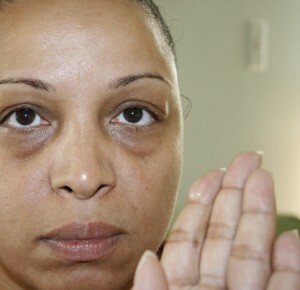 Not the makeup itself, but when removed after being worn too long, or slept in, you may notice dark circles under eyes. Stress – This is one of the leading factors of the condition. Little sleep, squeezing of the bridge of the nose or other physical side effects of high stress can cause you to look like the walking dead. Eczema – Eczema is a skin condition, but as most of the causes are external we list it here. Too Much Sun – This can dry out the skin and lead to dark circles under eyes. Take your pick! There are a multitude of things that can cause dark circles under eyes, and it may take you a while to discover yours. Keep track of what you eliminate and add to your daily routine, including food. If you look closely, you quite possibly will find the cause of your dark circles under eyes. Place an “i” next to the internal causes of dark circles under eyes, and an “e” next to the external causes. I love the video about potatoes helping out. Cucumbers are supposed to as well, right? I mostly have to keep my sinuses clear to prevent them, but that can be hard in the summer allergy season. Yeah Carrie, the sinuses can be a big contributor to dark circles, but some of the other home remedies you’ve mentioned can help. Thanks for the ideas. Very interesting to me to learn about all the possible reasons of dark under eye areas. I never knew salt in the diet and even make-up could contribute. But I have to wear make-up there to cover up the dark circles. A never ending cycle. Marjorie, thanks for the comments. Maybe you can find an alternative cure for dark circles under eyes while you wear the make-up, and then you won’t need it anymore! I really like this article. The information shared is just awesome. I will surely try out balanced diet to get rid of theses dark circles. Thanks for the comment Snape.